The Massachusetts Lottery is an official United States Lottery that is owned and operated by the Massachusetts State. 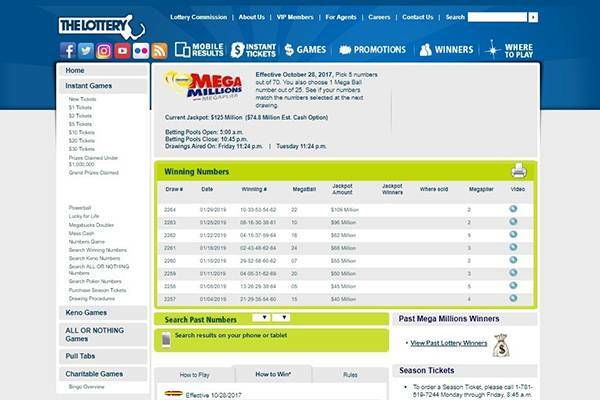 While the lottery is official and includes mega jackpot games, its site is just an information site and does not allow for online play. It does, however, provides aid to communities in the state. 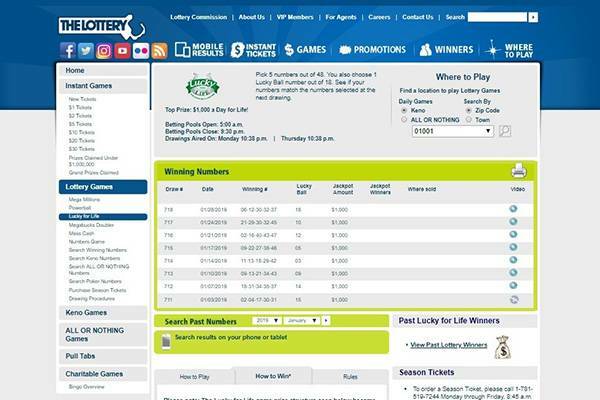 The Massachusetts (MA) Lottery site offers information on 6 lottery games in addition to horse betting, Keno and instant scratch games all of which are based in the state. The Lottery was established in 1971 and began operation in 1972 and has since become one of the most successful lotteries in the US with a number of options and guaranteed pay-outs. It is reputed to be one of the more innovative lotteries which adapt to the times asides from the ability to pay and play online which can be accorded to a security measure. As the Massachusetts lottery site is not suitable for online play, it often is just used as a reference or information site. 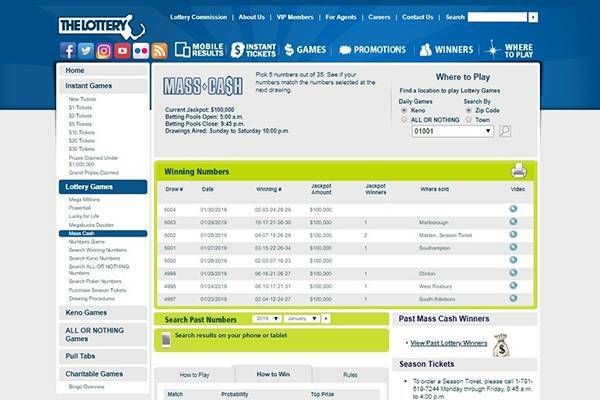 As much as the Massachusetts lottery offers information about an extensive amount of games, it is not convenient as players have to resort to other means to actually get to play them. The Massachusetts lottery is known to be the Commonwealth’s largest donor and source of unrestricted local aid as it returns some of the generated revenue to the cities and towns every year to help provide aid for their varying needs. The MA Lottery App is available for Android and iOS on the Google Play Store and Apple App Store. It allows players to scan their tickets, play the interactive jackpot and bonus games and check draws. The Massachusetts Lottery operates the Second Chance bonus and the Extra Holiday Bonus Promotions. Tickets for the lottery can only be bought at authorized retailers. The only other payment option possible is available through a VIP section on a different site that is not easily accessible to others. 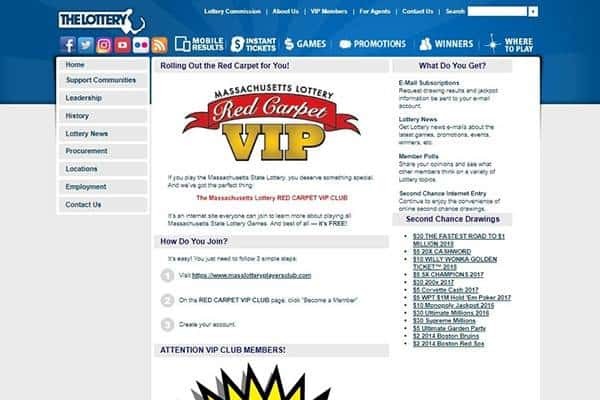 The VIP Club link directs sends information through emails on the results of lotteries, news, polls from members and the draws from the second chance game. There is however no information available until a player registers on the VIP site. All prizes that are up to and include $600 can be claimed from any of the lottery agents or offices without proof of identification. Prizes ranging from $601 to $49,999 must be from one of the designated lottery locations. For prices over $50,000, it must be claimed at the Lottery Headquarters. All tickets must be signed or can be claimed by anyone and prizes above $600 require providing acceptable forms of identification which could be Driver’s license, Massachusetts ID, Passport, Work ID, or Military ID. They also require Social Security Number as shown on Driver’s License, a signed Social Security card, Medicare card or Military ID. Winners of lifetime prizes are to provide birth certificates unless they opt for the cash option where this is available. Massachusetts online lottery has a page dedicated to covering as many frequently asked questions (FAQ) as can. This page is for quick access to own support, but for a personal support, there are other contact options. No chat option or a user-friendly contact support, there’s an email address thou. This is a bad experience that other online lottery agents/ sites – that are not official – would never go by as they are expected to greater transparency and higher availability. This site is accredited by Google Safebrowsing and Norton Safeweb. The site is however not for playing any of the games but is strictly an information site where details of events, announcements, scores and others are loaded. There have been complaints from players of having to wait long periods as long as 6 years for other players to come on in order to be able to play some of the lesser popular games of the lottery. There has also been fairly recent news of MIT students scamming the lottery to obtain big winnings. 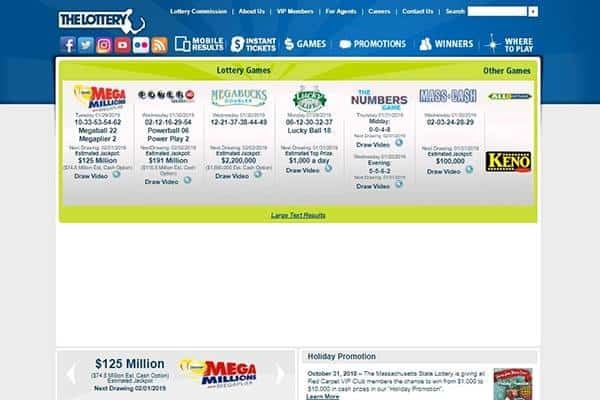 The lottery has also faced recent issues around a similar site that exploited players by pretending to be official and sending players emails stating they had won large prizes. By requesting taxes before prizes can be paid, the site was able to extort users, collect their personal information and in certain cases, led to identity theft. We rate the Massachusetts lottery a 3 of 5 and encourage players to be cautious and play responsibly. The Massachusetts Lottery is a well-known and reputable US government lottery with an extensive array of games although requiring purchase from authorized retailers.